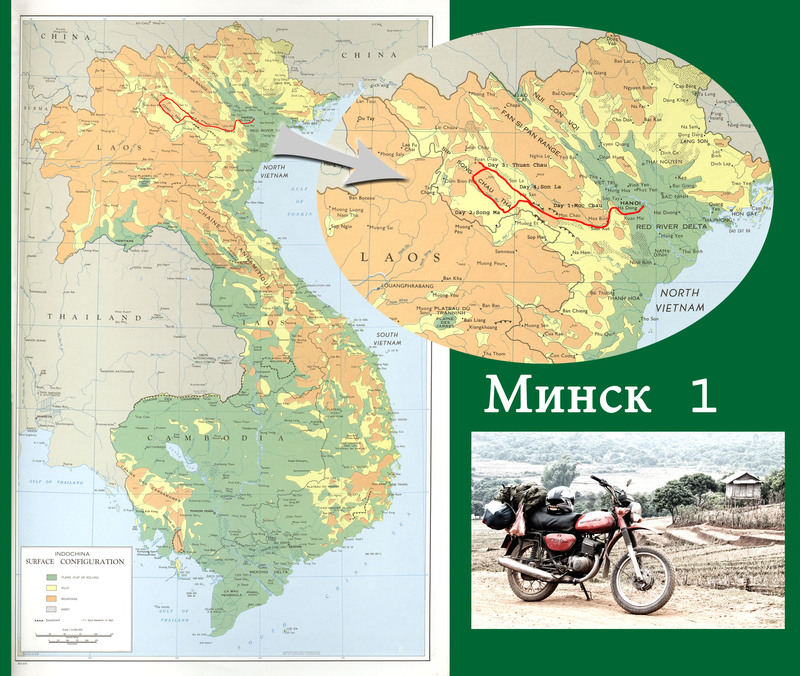 (translation: Minsk 1) — this post accounts my first Minsk motorcycle outing riding solo in the mountains west of Hanoi — yes, there is a part two. First a little about the bike — the beloved Belarusian Minsk is a rugged soviet-era workhorse that has served Vietnam backpacker and Taliban fighter alike. 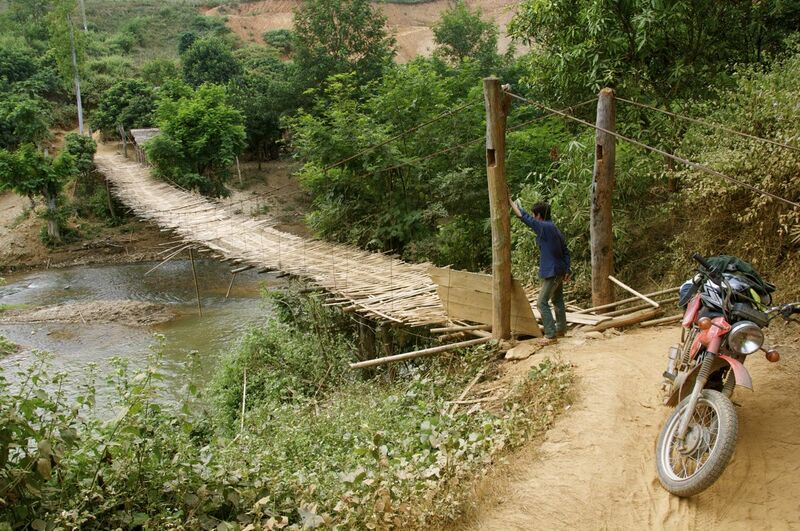 It does well in the mountains, and its simple mechanics lend itself well the to Vietnamese method of improvised and free-style mechanical repair. What I mean is that you can fix a Minsk with a hammer and chisel which incidentally it appears are the favored tools of the Vietnamese sua xe (mechanics). For the most part you are better of not letting them touch your bike, and doing the work yourself, but anyways, I digress. The engine is a 125 cc two-stroke motor with a glorious 10 horses to lug you up the mountain, leaving a global-warming-defeating trail of blue smoke behind. In general, the urban Vietnamese don’t think too highly of the Minsk and see only its outer appearance of antiquated, smokey, noisy two-wheeler, but you do get a lot of thumbs up and smiles as well when you roll into town with this classic. It took me about a week to get the bike dialed in: letting the shop I bought it from look it over, and customizing the seat to be taller and have a little more back support. The modifications and further preparations to the bike gave me a chance to ride around Hanoi’s bustling streets — a unique experience you can only have by doing. When 100 or so scooters waiting at a traffic light accelerate at the timer’s five-second mark before green (the traffic lights count down in Vietnam, and why wait for green?) the rumble is impressive. My initial plan for my first Minsk excursion was to do a clockwise loop around the mountains North of Hanoi and looping back to the city after about 14 days or so. I set out direction Dien Bien Phu, but events would not allow me to stick to my original plan. The map below shows my path, and as you can see I had to limp back to Hanoi prematurely. I melted a spark plug, and had a severe decrease in power leading me to think my engine was seizing. As it turned out, it was the rear-end of the bike that was seizing. The shop I had bought it from at a premium price was run by some expats who assured the bike was looked over carefully justifying the higher price. But this turned out to be baloney, as supported by my rear brake pedal nearly falling off on the way back to Hanoi. Click on the high resolution image below to see the itinerary detail. The trip, short-lived as it was, turned out amazing. The landscape started off as beautiful karst formations set in rice paddies, and slowly got more mountainous as I passed Hoa Binh. As I rose through the altitudes the bamboo forest yielded to misty pine trees, and the temperatures dropped. When staying in small towns like Song Ma the people are exceedingly friendly. If you eat at a restaurant alone, you will be offered shots of alcohol — be it vodka or no-label rice wine. This can be a dangerous proposition, as pretty soon every one in the place wants to do a shot with the giant foreigner who just rolled into town. When you are lost, people want to help even if communication is strained or they have never seen a map. I remember getting a little anxious when some tribesmen tried showing off their reading prowess pointing out Hanoi and other cities 200 km away, as daylight was fading. Like a good friend, the communist party is never far away either, as the centrally-located loudspeakers blaring out local news and announcements at about 5:30 am or so remind you. One time, I overheard militaristic exercise sounds coming from the local school yard at a way too early time of the morning, and could only think of George Orwell’s 1984 where big brother required fitness of all party members. This entry was posted on February 8, 2011 by 21stcenturyhobo. It was filed under Minsk, Vietnam . Glad to see your still enjoying your journey. Can you make a quick post about your gearlist for these week+ motorcycle trips in SE Asia? What an adventure! Wish I were there. thanks for keeping us up on your travels. I always enjoy reading your posts. Stay safe and have fun.